The upgrades are serving as a prototype for security changes the school district plans to make at all of its buildings. 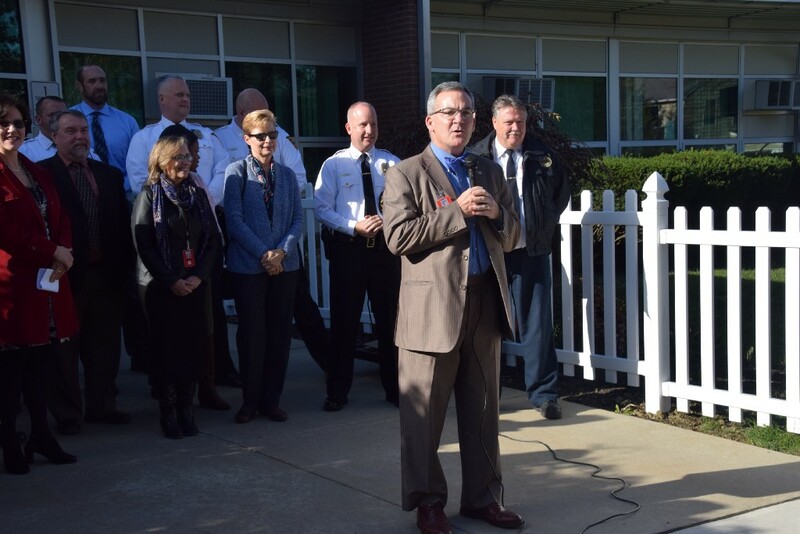 Cherry Hill Public Schools Superintendent Joe Meloche greets the students and staff of Barclay Early Childhood Center at the unveiling of the school’s new security upgrades last Wednesday. Barclay Early Childhood Center is now serving as a model for security in Cherry Hill Public Schools. Last Wednesday, the school district unveiled a series of new security enhancements at Barclay. The security upgrades are serving as a prototype for what the district hopes to roll out to all of its school buildings in the next couple of years. The district plans Barclay’s security upgrades at all of its schools as part of its planned 2018 bond referendum. The Barclay upgrades include a new security vestibule at the front door for guests entering the building, key access cards for staff, external strobe lights for use during a lockdown and additional internal and external security cameras. Superintendent Joe Meloche said upgrading security has been a major priority for the district. “Health, safety and security are a primary focus of what we do on a daily basis,” he said. The biggest upgrade to Barclay was the construction of a security vestibule. When guests enter Barclay, they will be buzzed in through the front door. They will then enter into the vestibule, where they will speak with a staff member who is sitting inside the main office. The staff member will be able to communicate with the guest and find out more information about the purpose of their visit. Assistant Superintendent for Business Lynn Shugars said adding security vestibules is crucial to keeping Cherry Hill schools more secure. Barclay was chosen as the prototype for the security upgrades partially because its main office is next to the front entrance and its entranceway allowed for the construction of a security vestibule with minimal changes. If vestibules are installed at other schools, the front entrances and main offices may have to be re-configured. Barclay is also the first school to use card access keys instead of traditional keys to allow staff to enter the building. The card access keys are programmable so each individual staff member will only be able to access buildings in the district where they need access. The addition of exterior strobe lights will help with security during a lockdown situation. “When the building is in a lockdown, whether it’s a drill or an actual lockdown, if you see the strobe lights, you’ll know not to enter,” Shugars said. The Barclay upgrades cost the district approximately $200,000. The cost of adding the security upgrades to the district’s other schools would vary building by building. In addition to the cost of the vestibules varying, larger buildings such as the middle and high schools will require more security cameras. The school district worked with police and fire officials on how to better the district’s security. Chief of Police William Monaghan emphasized the importance of the Barclay upgrades. 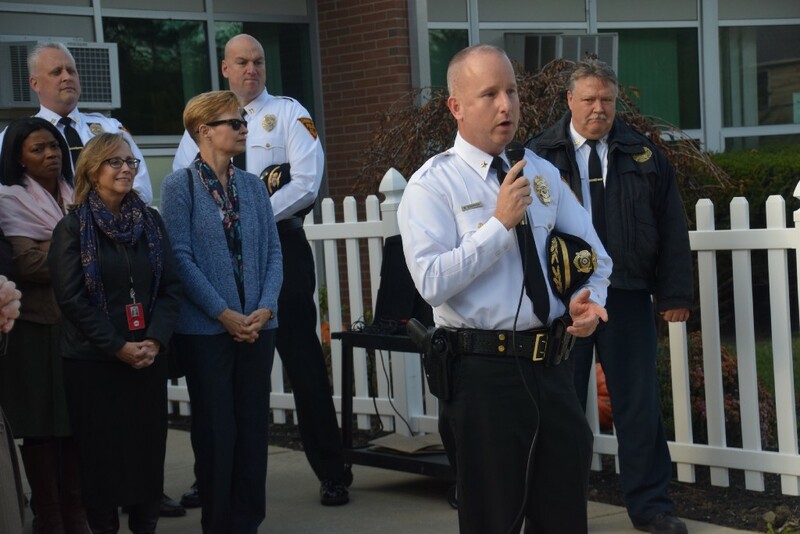 Cherry Hill Chief of Police William Monaghan speaks about the security upgrades at Barclay Early Childhood Center during an unveiling event last Wednesday. Meloche said the security upgrades are a top priority for the district looking ahead to next year’s planned bond referendum. He emphasized the importance of upgrading the buildings’ security to match the needs of today’s world.